For an average service member, it takes an obligation of 20 years to retire from the military. For their furry four-legged counterparts, it takes over 30 years to accomplish the same goal in dog years of course. Marine Corps working dogs date back to November 1, 1943, during World War II when 1st Marine War Dog Platoon out of Camp Lejeune, North Carolina attacked the beach of Bougainville, Solomon Islands. Today, working dogs lead regular Marine Corps careers by deploying, taking official photos and even attaining rank. 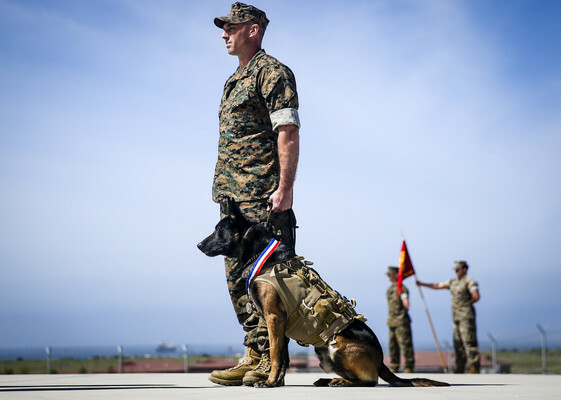 A Marine Special Operations Command working dog, however, has much more rigorous training, increased mission capability and known as a Multi-Purpose Canine (MPC). Roy is one such multi-purpose canine with MARSOC, and Koman just so happens to be his handler. On March 29, 2019, the command held a formal retirement ceremony to honor Roy’s five years of faithful service as a specialized force multiplier within the special operations world. After spending 16 weeks developing skills in explosives detection, tracking, controlled aggression, Roy’s amphibious capabilities, such as water insertion and extraction techniques, prepared him to serve in combat. For this accomplishment, Roy received the Military Working Dog Service Award, an award presented to working dogs and MPCs that deploy into combat. As a Marine receives a ceremony after 20 years, MARSOC conducts the same for MPCs. Once the MPC retires, it is put up for adoption and given priority to the owner. According to results from recent data from the Department Of Defense Military Working Dog Adoption Program, more than 90 percent of military working dogs and MPC’s adopted by their handlers. Before Roy was ready to transition into civilian life, the unit was required to ensure that there are no signs of aggression towards humans and animals. After this assessment, Koman was able to proceed in filing the necessary paperwork for adoption. When asked about his and Roy’s plans for the future, Koman stated that he plans to give Roy the most relaxing life possible.